Why Use An Accredited ASP/ASPM Stager? Professional Staging for New and Existing Homes. Greater Cleveland Area: Lake County, Geauga County, Cuyahoga County. Homes “Staged Right” Sell FAST! In this buyer’s market, condition is just as important as location. How can you make your Cleveland area property stand out from the crowd? Home Staging! What is staging? Home Staging is preparing your home for sale to appeal to the greatest number of buyers. It’s about selling your most important investment for the most money, in the shortest time on the market. Stage your vacant property with custom selected furniture and accessories from our 6,000 sq.ft. inventory. Or use your own furnishings & our professional experience to declutter and stage your home to increase your home value.The real estate market is constantly changing & cutting edge professionals know – education is key! The experts at HSR, Joyce received her Masters® in Home Staging in an intensive course taught by the Master of Home Staging, Barb Schwarz. Barb is recognized around the world as The Creator of Home Staging. 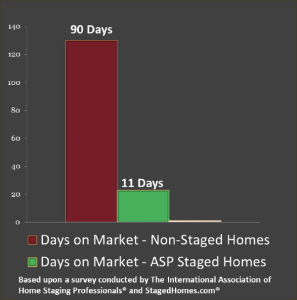 The Accredited Staging Professional (ASP®) designation is the only staging designation recognized by the National Association of Realtors®. This Masters Designation makes Joyce the most qualified staging professional in the area! 1.Professionally staged homes sell faster & often for more money. 2.The longer a home is on the market, the lower the price. 3. Most home sellers cannot view their house objectively. 4. Your online photos will outshine your competition. 5. Staging doesn’t cost a dime, see the average savings here! "You can't afford to wait any longer to STAGE your home!" ©2015 Homes Staged Right. All Rights Reserved.